This hotel marries old world elegance, modern amenities and attentive service to create an idyllic urban retreat. Rooms are tastefully decorated in a contemporary style and equipped with every comfort. Some rooms feature private terraces and beautiful views of the surrounding area. 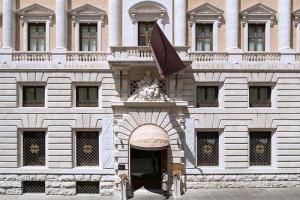 The hotel is conveniently located to major historic monuments nearby including the Pantheon, the Trevi Fountain, the Colosseum and the Spanish Steps. Located in the historic center of Rome, between Via Veneto and Piazza Barberini, 150 meters from the Barberini metro station. St. Peter's Basilica, the Colosseum, the Roman Forum, Via Veneto, Villa Borghese, the Trevi Fountain, the Spanish Steps, Via Condotti.